Every second buyer (in random order) of all our products, who left a positive review - gets one of more than 40 different games for Steam. Which one? You will find out about it when you receive your GIFT on the mail. ATTENTION! The key can not be activated in Origin and Steam. 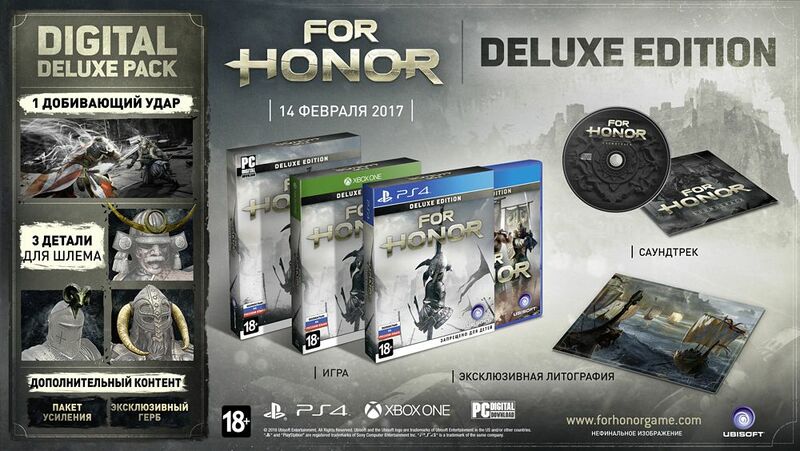 - Deluxe Pack: 1 finishing hit, 3 parts for the helmet, gain package, exclusive coat of arms. Walk your way, defeating enemies on the battlefields of For Honor ™, a new game in the genre of "third-person action", developed by Ubisoft Montreal with the assistance of other Ubisoft studios. Enter the battle as one of the greatest warriors - a proud knight, a violent Viking or a mysterious samurai. 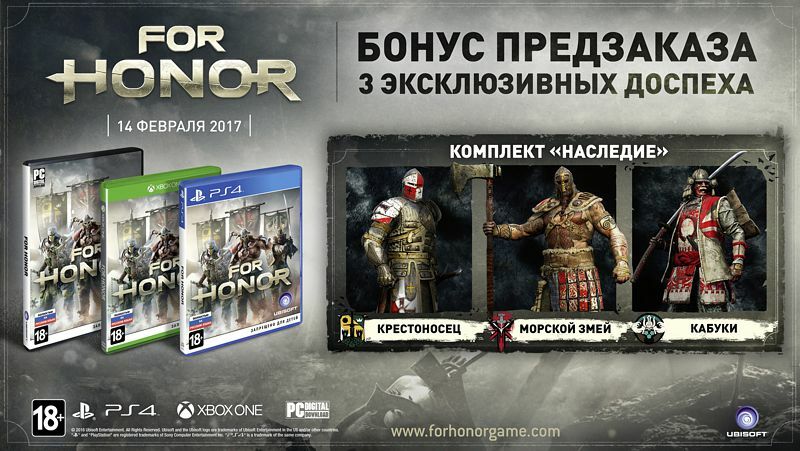 For Honor - a dynamic game, plunging you into a huge world, where you need to combine skills and fiercely fight in close combat. The unique control system "The Art of War" will allow you to fully control the movements of characters who, in the struggle for their ideals and native lands, use a wide variety of skills and weapons. Defeat the enemy warriors, archers and heroes who will be on your way, and feel the spirit of a real battle. Fight alone or share the joy of battle with your companion. Play with friends on the network or in the joint game mode "split-screen"; Destroy AI opponents alone. - Each time before the battle begins you can choose one of the great warriors of the past: a samurai, a viking or a knight. Each of them has a special style of combat, uses a unique weapon and has the strength to determine the outcome of the battle. The possibilities of individualization will allow you to change the appearance of the warrior to your liking: choose a suitable bib, shoulder pads and helmet. Give a unique appearance to the whole team. 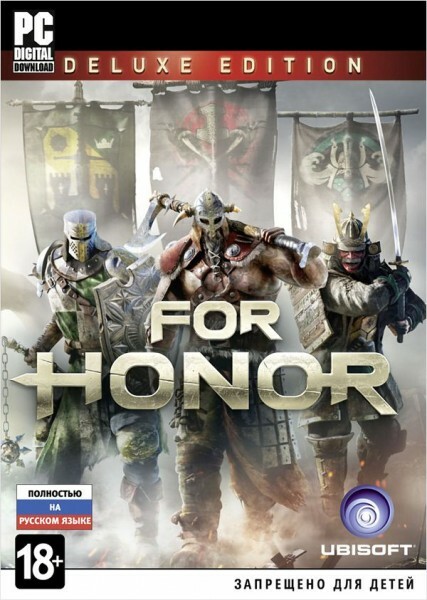 - Plunge into the world of For Honor: storm locks, meet face to face with deadly opponents - discover the incredible story of warriors fighting for life and death. You will face intrigues and betrayal. It will take to use all the skills and cunning, because the bloodthirsty commander Apollo will not give up without a fight. - Network game modes allow you to assess your level of strategic thinking and improve your skills. In a ruthless battle you can win only by working in a team. Coordinate actions with other players: who kills enemies, helps allies or seizes territory. UNIQUE SYSTEM "ART OF WAR"
- Feel the weight of the weapon in your hand and the strength needed to swing. The new control system will allow you to fully control the movements of the character and apply accurate strokes.